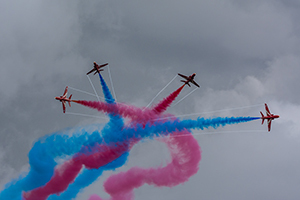 The RAF Scampton airshow is the newest addition to the UK air show calendar, organised by the Royal Air force Charitable Trust, who amongst supporting a wide range of RAF charities and projects also organise The Royal International Air Tattoo. RAF Scampton has a rich aviation history dating back to the First World War where the Royal Flying Corp flew FE2b’s in response to the Zeppelin threat. The station was also the home to the famous 617 ‘Dambusters’ squadron during the 2nd World War and played host to Britain’s nuclear deterrent in the form of the Avro Vulcan during the cold war. More recently Scampton is home to the Royal Air Force Aerobatics team, The Red Arrows. The shows static park was well supported by the RAF with aircraft from both the front line and the training squadrons. Sadly the A400M was unable to attend the show due to supporting the hurricane relief effort, a worthy cause I am sure we can all agree. However, the 41 Squadron ‘Seek & Destroy’ Typhoon made an excellent display wedged between two Tornado’s and the RAF’s training squadrons provided a Grob Tutor and a brace of Tucano’s including one marked out in war era Spitfire colours. 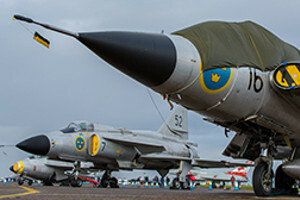 There were also a number of international visitors, notably the Royal Canadian Air Forces’ CF18 Hornet and a host of rarely seen aircraft from the Swedish Air Force Historic flight including the AJS 37 Viggen and SK 35C Draken. The Scampton-based Hawker Hunter Aviation supplied a unique line-up of cold war warriors including a Hunter, Phantom and Buccaneer (all largely still airworthy). An eclectic mix of civilian visitors completed and enhanced the static park. 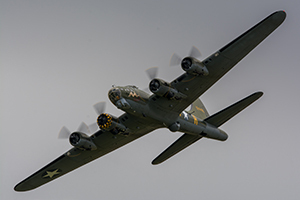 A wide range of stalls, marquees and activities filled the showground making this an excellent day out for both families and aviation enthusiasts alike. 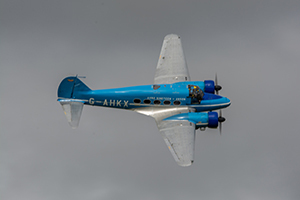 Despite a mixed forecast, the weather for Saturdays display did not hamper the show too much, with its mix of light cloud, sunny spells and moderate winds. 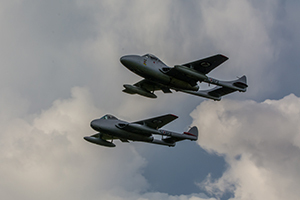 The modern jets were largely unfazed by the occasional light shower, whilst the historic acts were able to carefully time their displays to enjoy the optimum conditions between the bouts of rain. 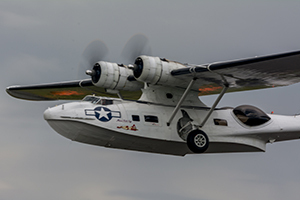 Only the unfortunate PBY Catalina experienced a prolonged shower during its display, but it is a flying boat after all! 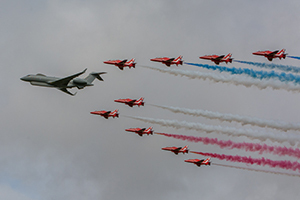 It was fitting that the inaugural RAF Scampton air show would be opened by the home team, The Red Arrows, who performed a unique flypast accompanied by the Sentinel R.1 swiftly followed by a single flypast from the gargantuan E-3D Sentry. 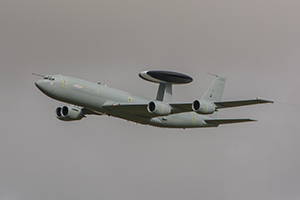 The latter two aircraft from neighbouring RAF Waddington, home of the UK’s Air Intelligence, Surveillance, Target Acquisition and Reconnaissance (ISTAR) unit. The Red Arrows would return later for a display that was dogged with a number of issues; fortunately the rumbles of thunder did not materialize into a storm, but the low cloud was a limiting factor. Red 5 was already absent from the line up, but the planned 8-ship display was further reduced when one of the ageing hawks suffered a minor issue prior to take-off. Eventually the 4 jets of ‘Gypo formation’ were able to put on a brave half-display, but for the Saturday at least, this was not to be the triumphant home performance the Reds deserve. It has not been an easy 60th year for the RAF’s other major display team, The Battle of Britain Memorial Flight; with long term issues affecting the Dakota and delays to the major servicing of the Lancaster at the start of the season. More recently an issue affecting the merlin engines was identified causing an immediate grounding of all but one of the fleet (the Griffon engine Spitfire). 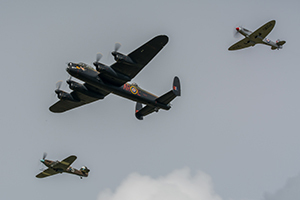 Therefore, it was a real delight when the classic three-ship formation of Lancaster, Hurricane and Spitfire appeared on the horizon. Aside from the roar of the aforementioned merlin engines the airfield fell silent as the Avro Lancaster poignantly circled the former home of the Dambusters squadron. Overall, the air display was superb. A fast-paced, wide and varied schedule saw something for everyone. Peter Teichman’s Tuskegee Mustang, B17 Sally B and the Catalina provided a trio of American warbirds. 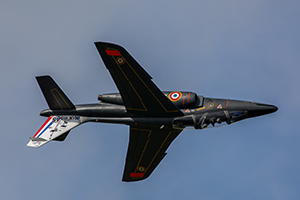 Cold War jets were represented by the Strikemaster Display team and the Norwegian de Havilland Vampires. Meanwhile The French Alpha Jet, Belgian F16 and RAF Eurofigher Typhoon brought the show up-to-date. Not everything went smoothly, A starboard engine issue prevented the Percival Pembroke from getting airborne which sadly blocked the run way and left the Global Stars frustratingly grounded. 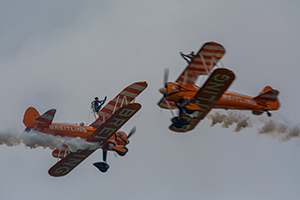 But, the organisers were able to keep the show rolling with Peter Davies’ nimble Autogyro and Breitling Wing-walkers moving up the schedule whilst the Pembroke was recovered. 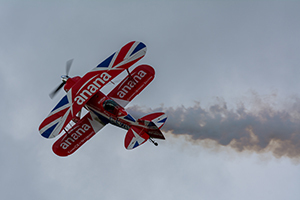 Rich Goodwin’s Pitts Special Aerobatics are worthy of a mention, as his daring, high-energy routine culminating in his signature move ‘the Tower of Power’ thrilled the crowds. 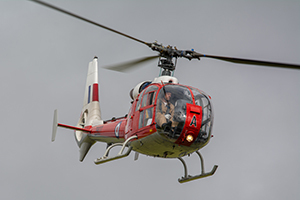 The Gazelle Squadron provided the helicopter also known as the ‘whistling chicken leg’ for the rotary fans. 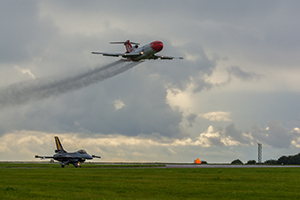 T2 Aviation also supplied an oil-spill response demonstration in the form of the Boeing 727, whilst the Avro Anson, OV-10 Bronco and RAF Falcons completed the 5 hour flying display line-up. 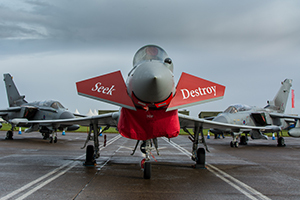 It was truly a memorable experience to attend this inaugural show at historic RAF Scampton. A well-organised shuttle-bus system overcame some potential car-parking and geographical difficulties and an excellent build-up on social media coupled with an informative, well-put together souvenir programme added to the excitement. 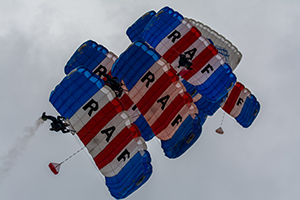 The RAF charitable Trust have once again shown their abilities to put together a fine air show which will return on the 8th & 9th September 2018 for RAF100 – put the date in your diary now!